As an effort to cease polio disease once and for all, Rotary clubs from Johor Bahru Sentral, Puteri Lagoon Johor Bahru and Bandar Seri Begawan are working on a cycling event; ‘Sunway Iskandar End Polio Ride 2019’ in collaboration with Sunway International School in Iskandar Puteri, Johor and Johor Bahru’s Happy-Riders Connect cycling club. 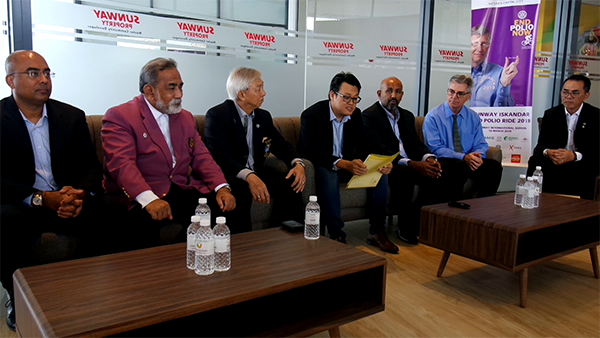 Organising Chairman Eric Chang shared that local corporations such as Sunway Iskandar Sdn Bhd, X-Park Malaysia, AME Constructions Sdn Bhd, Jubin BMS (1990) Sdn Bhd, Azam Motors Sdn Bhd, Regency Specialist Hospital, Asia Medevac Services Sdn Bhd, SDS Food Manufacturing Sdn Bhd, Sweet Heart Food Industries Sdn Bhd and Portico Design Work Sdn Bhd are supporting the event and within a month, has raised a collective amount of RM70,000.00 in which they aim to get to RM100,000.00 by the end of the event. All proceeds will be donated to Rotary Foundation’s very own Polio Plus fund and will be combined with one of the strongest advocates of a polio-free world, Bill & Melinda Gates Foundation by two-to-one. The free event will be hosted by Sunway International School Iskandar Puteri this Saturday, 16th March 2019, and 400 riders of Happy-Riders Connect are to fun-ride a 25km journey around Sunway Iskandar, with IPK Iskandar Puteri’s officers regulating the safety aspects. The public may join in the effort through sponsor-a-rider at RM100 per rider or donate any amount to the collection box on the day of event.